Stand for the Silent was started in 2010 by a group of high school students in Oklahoma City, OK, after they heard the story of Kirk and Laura Smalley’s son, Ty Field-Smalley. At eleven years-old, Ty took his own life after being suspended from school for retaliating against a bully who had been bullying him for over two years. Stand for the Silent exists as a platform to allow Kirk and Laura to share their story and offer education and tools that will prevent their tragedy from happening to another child and family. Kirk and Laura’s mission is to continue to change kids’ lives and bring awareness to bullying and the real devastation it causes. Since May 2010, Kirk and Laura Smalley have traveled to over 1,000 schools and spoken with over 1,000,000 kids! In March 2010, Kirk and Laura met privately with President Obama and First Lady Michelle Obama in The White House prior to attending the first ever White House conference on bullying. THE PROGRAM The Stand for the Silent (SFTS) program addresses the issue of school bullying with an engaging, factual and emotional methodology. With the help of student leaders, Kirk Smalley presents his inspirational story, and students are shown first-hand the life and death consequences of bullying. Through this unique approach, lives are changed for the better. Students, some for the first time, develop an empathetic awareness through education and understanding. The goal of the program is to start a SFTS chapter at each participating site. Each chapter consists of a group of students committed to change. These students will no longer stand for their peers to suffer at the hands of a bully. At the end of each event, pledge cards are given to those who agree to stand for the silent. The pledge speaks of respect and love … hope and aspiration. Above all, it illustrates the main lesson taught through the Stand for the Silent program: I AM SOMEBODY. Yuba-Sutter Stand for the Silent (Yuba-Sutter SFTS or YS-SFTS) is a program that offers bullying education, resources and support within the Yuba-Sutter community of Yuba and Sutter counties in California. Our goal is to put an end to bullying in our community by providing preventative education, empathetic practices, realistic solutions and personal support to all individuals impacted by bullying. Our program is intended to help all victims of bullying, their family members, school educators, administrators, offenders and all others affected by bullying. 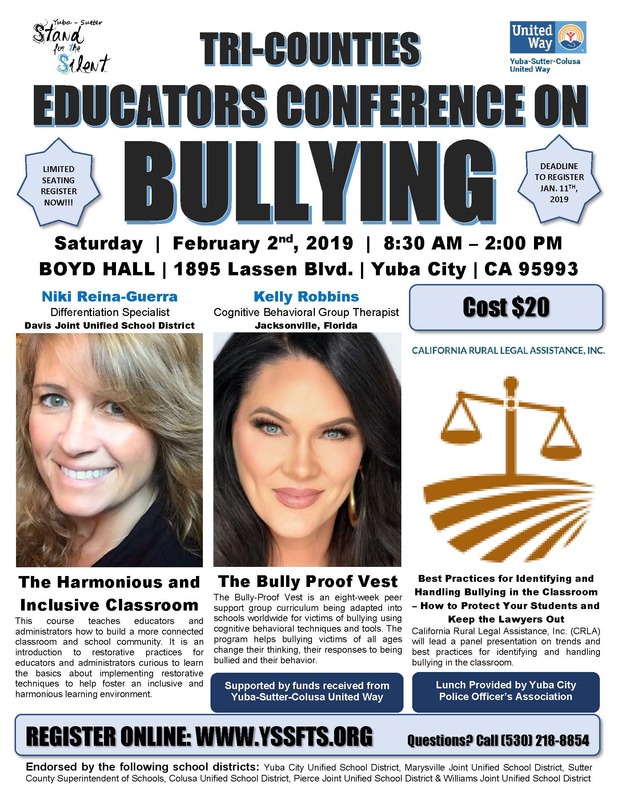 Our dream is that the Yuba-Sutter Stand for the Silent mission and example of prevention, results and assistance through our outreach programs will expand to our neighboring communities and therefore, wipe out bullying altogether.